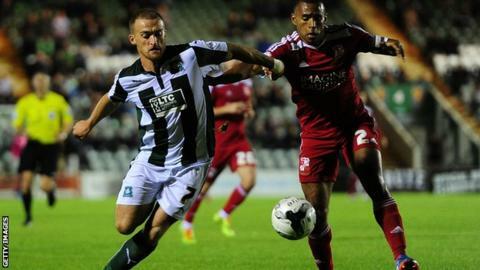 Plymouth Argyle striker Lewis Alessandra has urged his team-mates to do a professional job as they look to cement their League Two play-off place. Only a heavy defeat for the Pilgrims at Shrewsbury and a big win for eighth placed Luton Town, with an eight goal swing, can deny them a play-off spot. "We feel like we've got one foot in there but stranger things have happened," Alessandra told BBC Sport. "We'll just be going to Shrewsbury hoping to do a professional job." Plymouth manager John Sheridan has confirmed that he will rest top scorer Reuben Reid at the New Meadow as he has recently been playing through injury. Alessandra's potential strike partners for the last game of the regular season include Zak Ansah, Ryan Brunt and Jason Banton. "Reuben's been struggling for a while now, he's not been fully fit so maybe that four or five days of rest will do him good," Alessandra added. "It's good to play with a target man and work off him but I don't know who the gaffer plans to play." The Devon side could come up against either Southend, Bury or Wycombe in the play-off semi finals if they hold on to seventh place. Alessandra started his career at Oldham though his hometown is Bury. "If we got Bury in the play-offs and won it would be nice - I'd have a lot of family and friends there," he added. "But out of our three possible opponents I honestly really don't mind who we play."